The king had won another war, and wanted the victory commemorated, and decreed that a statue of himself on horseback leading his troops into battle should be designed, carved, and copied, and erected throughout the land in every single city, town, municipality, and all villages containing a population of more than five hundred souls. The village of K_ had nearly six hundred souls in it. And so it was that the court engineers came and set a statue down right in the middle of the square. It was made of grey stone – it was said that marble had been reserved for the cities alone – and was some twenty feet tall; the horse stood up ready to charge, and balancing upon its hind legs looked for all the world as if it were on tiptoes; and on its back the king raised a sword high, or maybe it was a cutlass, and his mouth was wide open, presumably in the act of shouting out some heroic order or other. The king’s nostrils were flared; so were the horse’s. The people of K_ quite liked the statue, really; it was a talking point, and it was something to shelter beneath when the sun was hot. And then, one day, not very long after, the king decided it was time to go to war again, and that he would need all the young men to fight alongside him. And in a trice the young men left, and the population of K_ dipped far below five hundred, and really they no longer qualified for a statue at all. A year passed, and the young men never came home, and it became clear they never would. The burgomaster went to see the stonemason. He proposed that the statue be turned into a memorial to all those from K_ who had died and would not return; at the top of the plinth the stonemason could engrave the words ‘OUR GLORIOUS DEAD’, and beneath that, in smaller writing, but very neat, the names of all the young heroes. “Do you like ‘Our Glorious Dead’?” said the burgomaster. “I was also toying with ‘OUR FALLEN SONS’.” The stonemason told him he could have both, if he were paid a couple more coins for the effort, and the burgomaster readily agreed. The burgomaster produced a list of all the names that needed to be carved on to the stone, there were exactly a hundred of them, and the stonemason decided that if he carved one name every morning, and one name every afternoon, then that would be two names carved a day, and the job would take fifty days to complete. And so it was. It was another warm summer, but the stonemason was in the best possible place in the whole of K_, working in the cool shadow of the statue. In the morning he would carve a name upon one side of the plinth; in the afternoon, when the sun had moved, he would carve a name upon the other side. There was no order to the names, he would engrave them at random, he’d look down the list and see whichever name caught that day’s fancy. And the people of K_ would come and see how he was progressing, and when the day came that he would choose the name of one of their dead sons, they would get so excited, and read the name out loud in wonder, and press their fingers into the inscriptions and marvel at the weird shapes of the letters, and weep for joy that at last their sacrifice had been acknowledged. One evening Mr and Mrs Klein came to see the stonemason. Mr and Mrs Klein had no children. The stonemason couldn’t guess what they might possibly want. They stood there in his cottage and looked nervous. “We would like you to engrave the name of our son,” Mr Klein said. “We have money,” said Mrs Klein. “You don’t have a son,” pointed out the stonemason. “We have money,” said Mrs Klein again. The stonemason felt shamed by the new commission, but he didn’t know why. He knew he couldn’t engrave the name on the statue with all the village there to see. So, sleepy as he was, he lit a candle, and went out then and there, he took up his chisel and he tapped out this latest child who had been lost in war. The moon hid behind the clouds, and the mason’s arms were weak, and it took hours to complete the job. For the sake of the real martyrs, he made sure that Raphael Klein’s name was slightly smaller than theirs. He had barely had an hour’s sleep when he was woken by someone thumping at his front door. The mason stood his ground. When confronted by any extremity of emotion, he always chose to imitate the stone he worked with and understood so well, his face became impassive, his shoulders slumped hard as granite. “I just follow orders,” he said. A couple of hours later the burgomaster returned. “Two silver coins,” he scoffed. “Look here. I’ve brought you five gold coins. And for them I want you to give me two sons. One is called Peter, the other is called Pyotr. They were good boys, strong boys. Identical, born in the very same hour, you couldn’t have told them apart – but I could, I could. Twins, and always the best of friends. They were the world to me. And they marched off to war together, and first they slapped me on the back, they said to me, Papa, if we never meet again, it’ll be for a higher cause – and they laughed, because they were men, do you see? And I laughed too. They gave me the courage to laugh. Pyotr joined the cavalry, Peter the infantry. And they died together, at the exact same time. Peter was stabbed through the heart in the midst of battle; elsewhere on the field, Pyotr’s horse was blown up by a mortar shell. They died at the very same instant, inseparable even at the end – and they never knew. They never even knew.” And the burgomaster cried. The stonemason knew that the burgomaster had sent four sons off to war already; with the twins, that made it a tidy half dozen. The villagers of K_ came to the stonemason with all the money they could afford. They bought dead sons. Some bought an entire platoon of dead sons. Some only wanted one son, a single son, a handsome son, kinder and more honourable and just plain better than the one they had spent years bringing up and had sent away shaking and weeping and scared to die. And the villagers would tell the stonemason the stories of their new sons’ deaths, and most often they had died saving the king himself, or if not, the whole army, there had been such meaning to the deaths, they had died so that hundreds more could live – and always they’d done so with a hardy smile or a witty quip, it was never in pain or filth or puke, it was never screaming for their mummy and daddy to save them, why wouldn’t their parents save them? And it was easier to part with these sons, because they’d been born at the end of a chisel just so they could be killed. And it was harder to part with them, too, because they were perfect. And as the villagers told the stonemason the stories, oh, there were tears of great pride, and tears of loss, a loss all the greater for being for something never actually won in the first place. The stonemason listened politely, but he wished once they’d paid him the money they’d just shut up and leave. He had a lot of work to do. Pretty soon there wasn’t room on the plinth for all the names. If the burgomaster had chosen between ‘Our Glorious Dead’ and ‘Our Fallen Sons’, then a few more might have been squeezed on, but there it was, he’d just had to be indecisive. The names soon snaked up the horse’s legs, on to the horse’s flank, right across the horse’s arse. And on to the king himself; the king’s face was tattooed with the names of all the boys he had killed, or would have killed, if the boys had been foolish enough to let themselves be born in the first place. The stonemason always did these special names at night. He was no longer ashamed. But the darkness felt the right place for all the never-was-es and should-‘ve-beens. He continued to work on engraving the real dead in the daytime, but he was tired, and frequently he made spelling mistakes. No one seemed to mind. And the stonemason became very rich. And once, when he was dozing, he dreamed that the statue fell on him. He hadn’t even seen it start to topple, it must have all been very quick, one moment he was condemning another boy to death, the next he was sprawled out flat, pinned fast by the king’s buttocks. And he knew that the statue must weigh several tons, by rights he should be squashed to a pulp, but he understood stone, stone ran through him like lifeblood, stone would never hurt him. It was the dead. It was the dead who’d done it. He’d burdened the stone with too many dead, and it had made the stone top heavy – and it hadn’t been fair on the stone, it was just unfeeling stone, why should the stone be made to care for them? He knew he could push the statue off, set it back on to its plinth, and they’d both be right as rain – but it was all the dead standing on top of it, they made it impossible, the dead all stomping down with their little army boots, he couldn’t budge it an inch. They stared down at him, and he knew they weren’t doing it deliberately, they didn’t know what they were doing, they were just stupid corpses. And there were just too many. There was just one too many. One fewer corpse in the world, and he could have set himself free. When he awoke, he was drenched with sweat. He steadied his breathing. He got up. He went to his coffers. And went out, into the night. The house of Mr and Mrs Klein was all dark, like mourning. They had only ever asked him for that one son, the first son, Raphael. After that they had avoided the stonemason, turned away from him at the market, or in church, and he had never known why. Maybe they had realised Raphael’s inscription was smaller than the others, and more discreetly hidden. Maybe they thought he would tempt them to create and then murder another child. Underneath their door he slid two silver coins. He went back home, and to bed, and his conscience never troubled him again. One evening, when the moon was its brightest, the dead came back. Not the dead who had ever lived, but the dead who had never been. Into the town they marched, right to the square, right to the statue itself. And Raphael Klein was at the front, he was their leader. And everyone could tell it was Raphael Klein, even though no had ever seen him before, because he had just his father’s mouth and just his mother’s eyes, he did his parents proud. He announced that they had all been granted a furlough. Just one night, to visit their families. Just one night, and then back to war. And that was good, because war was good, all the camaraderie and all the honour, and they were winning, didn’t their parents feel proud? And the soldier boys read the inscriptions on the memorial, and how they laughed. They weren’t dead, they were well and fit and happy, couldn’t Father see how well, didn’t Mother feel proud they looked so well in their smart uniforms? And the villagers of K_ were proud, and no one wanted to point out that some of them were missing limbs, or parts of their body, or parts of their head; not for all the world did they want to hurt their children’s feelings. There were cakes and ale, and dancing, and games, and no one slept that night. The stonemason stayed at home. He had never carved a name upon the statue for himself. He had been tempted. Of course he had been tempted. When the knock sounded at the door, slow and heavy, the stonemason refused to open up. “Go away!” he said. More knocking, so slow, heavier still, and it was not the knock of a dashing young hussar, it was the knock of a simpleton, from the lowest dregs of the regiment, what was standing behind the closed front door was nothing better than cannon fodder – “I don’t want you!” he shouted at it. For a moment the knocking stopped. But then, as before, no more insistent, but just as mindless, thump, thump, thump. And outside he could hear his neighbours celebrating what never was and could never have been. And there was silence. And he thought he had chased his son away. And that was a relief. And then, so suddenly, it was such a dreadful thing. “Are you still there?” he said. Still nothing, but the sound of villagers at play, mocking him. “Please?” And he opened the door. There he was, waiting for him. Unnamed. And featureless. His face a fracture of rock and chalk. “My son,” he breathed. And he put his arms around him, and the statue cut at his skin, and made him bleed, and he didn’t care. I’ve only read this once so I can’t have a proper response, but my initial feeling is one of loss and fury. i have to read it again and again. – If I win, I will be forced to learn how too manage money. free program, to catch whatever might bbe missed by Spybot. So. This is the idea! 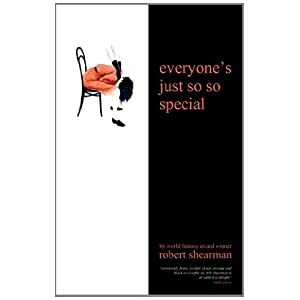 Robert Shearman has worked as writer for television, radio and the stage. He was appointed resident dramatist at the Northcott Theatre in Exeter and has received several international awards for his theatrical work, including the Sunday Times Playwriting Award, the World Drama Trust Award and the Guinness Award for Ingenuity in Association with the Royal National Theatre. His plays have been regularly produced by Alan Ayckbourn, and on BBC Radio by Martin Jarvis. 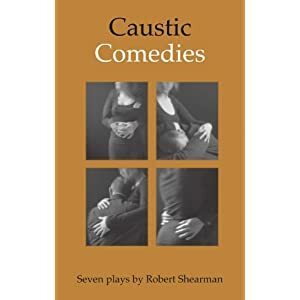 A selection of his plays have been collected in book form as Caustic Comedies. However, he is probably best known as a writer for Doctor Who, reintroduing the Daleks for its BAFTA winning first series in an episode nominated for a Hugo Award. He has also written many popular audio dramas for the series for Big Finish. 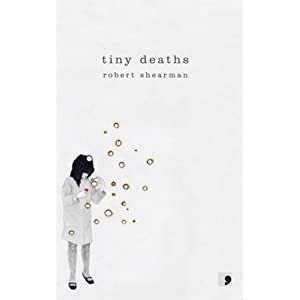 His first collection of short stories, Tiny Deaths, was published by Comma Press in 2007. It won the World Fantasy Award for best collection, was shortlisted for the Edge Hill Short Story Prize and nominated for the Frank O'Connor International Short Story Prize. No Looking Back was selected by the National Library Board of Singapore as part of the annual Read! Singapore campaign. The two series of The Chain Gang, his short story and drama project or BBC7, both won the Sony Award. 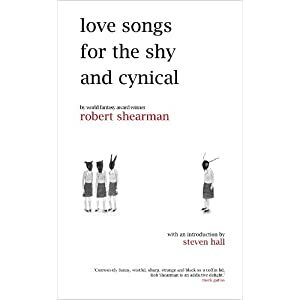 His second collection, Love Songs for the Shy and Cynical, was published by Big Finish in 2009. It won the British Fantasy Award for best collection, the Edge Hill Short Story Readers Prize and the Shirley Jackson Award, celebrating 'outstanding achievement in the literature of psychological suspense, horror, and the dark fantastic'. History Becomes You, from his third collection, Everyone's Just So So Special was nominated for the Sunday Times EFG Private Bank Award. The collection won the British Fantasy Award. In 2012, his fourth collection, Remember Why You Fear Me, a retrospective of his best dark fiction, was published by ChiZine Publications.